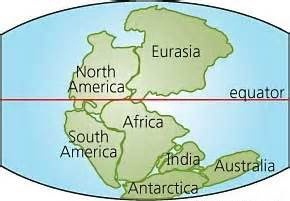 Why The Continental Drift-Pangaea And Tiny Expanding Earth Theories are Wrong. Hello…It is okay to take the pictures of the continents from a round globe and put them on a flat surface. We call that a map. Then when looking at the map it is obvious that some continents were connected. Many more pictures telling the rest of the story on my other pages. Just click from the # menu above. When wanting to know whether all the continents were connected and how, some folks go a step further. For an experiment some take the flat map pictures and slide them together with their hands on a coffee table. That is how you come up with the picture of ” Pangaea” and how the continental drift theory was born. It does form an odd shaped island on a big world that would cause the earth to spin uneven or significantly wobble. The theory also proposes that the Atlantic ocean is newer and getting larger. The theorist say the Pacific is older and getting smaller. 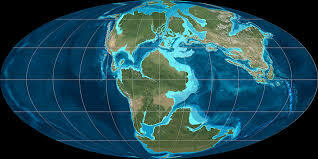 The truth is the ocean floors are dated much younger then the thicker continents and were formed at the same time. Also India has never left the continent of Asia, yet they have it driving across an ocean. ……..then slides to this 300 million years ago ???? How ? ….I do not know..
Today’s earth with oceans and the ocean ridges on both sides, in each ocean. Click the two maps to enlarge them. Some folks for an experiment have put the continents back as a round object. When doing so they realized the earth was once smaller. Otto Hilgenberg , Warren Carey and recently Neal Adams have a theory, that the earth has some how been growing for over a 100 million years. What they did is take the pictures from a flat map and put them together as a round object. 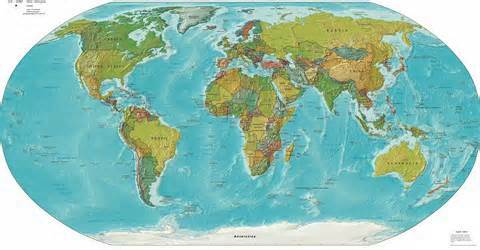 They squish the continents to make them fit instead of stretching them apart. They did not take into consideration how mountains are formed. The land contracted as a reaction when it first broke apart and cracked while it expanded. So they did not stretch them out in their model. 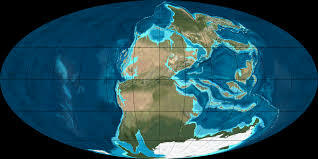 Also they did not account for the continents underwater shelves. This is why their clay models starts off less than 1/2 the size of our current earth and they claim it is still growing. They claim the earth is hollow. Tiny earth Model with squished Continents. The truth is the continents and the oceans are not getting bigger and we see no evidence on the ocean floors. There would be millions of ridges formed over time, not just one that continues between the continents. Some others followed and used graphics to explain the theory. They make an even bigger mistake by putting Australia between China and America. They have Australia going all the way up and connected to Russia and Alaska. The truth is China and America were connected. Russian and Alaska were always connected. This can all be clearly seen by looking at the ocean floors. 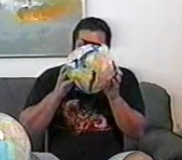 I cut up a globe and started off with round pictures and used a balloon. A video by me explaining their mistake. I cut up a globe and started of with round pictures. 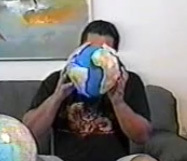 I put them back as a round earth on a balloon and put air in and let it out. The earth was only less than 1/4 of its current size. There was a solid crust you could walk around. The simplest answer in science is often the correct one. The earth expanded, only one time, on one day about 4350 years ago and it will expand again. The increased internal heat is what made some layers change in density and caused the earth to expand. I Joseph Benante have been showing folks this since 1995. 100s of 1000s have seen my videos over the years on a local access Tv channel. I had never heard of the people above or their theory prior to my experiment. It was not until 2005 when I put my website together. In 2007 is when I heard about Neal Adams, he was on FOX news talking about Japanese fossils in the U.S. and an expanding earth. I was very interested and quickly recorded part of it. I liked the interview, because it furthered the idea Pangaea could be wrong. Science’s reason why Plates Tectonic ? To enlarge some pictures just click them and scroll up/down and sideways. Science Theorists explanation of the force which makes the Continental Drift theory work, is convection subduction zones. They believe the earth is like a pot of water with heat under it. Even though the land is under the water they liken it to blocks on top of the water. They believe the earth is convecting in two giant circles under the ocean floor. One circling left, the other circling right. Is that in the Pacific or Atlantic ??? Remember they are using two dimensional circle drawings and the theory would not work if it was a 3D sphere. The truth is convection is the cycle of heating and cooling not the circle. The reason the blocks move apart, is the heat is able to rise in the center of the water. The sides of the pot and the top of the water are being cooled by the air around it. Notice the blocks do not float downward into the bottom of the pot. In Reality Heat radiates out in all directions. The heat radiates outward in all directions because the earth is round. The heated material expands under the surface and cools. The thicker continents and the oceans are heavier then the heated magma. They want to settle inward. This cycle of heating and cooling leads to the buildup of pressure. The results are earthquakes and volcanoes. The continental drift, the convection current subduction zones and tectonic theories are wrong. 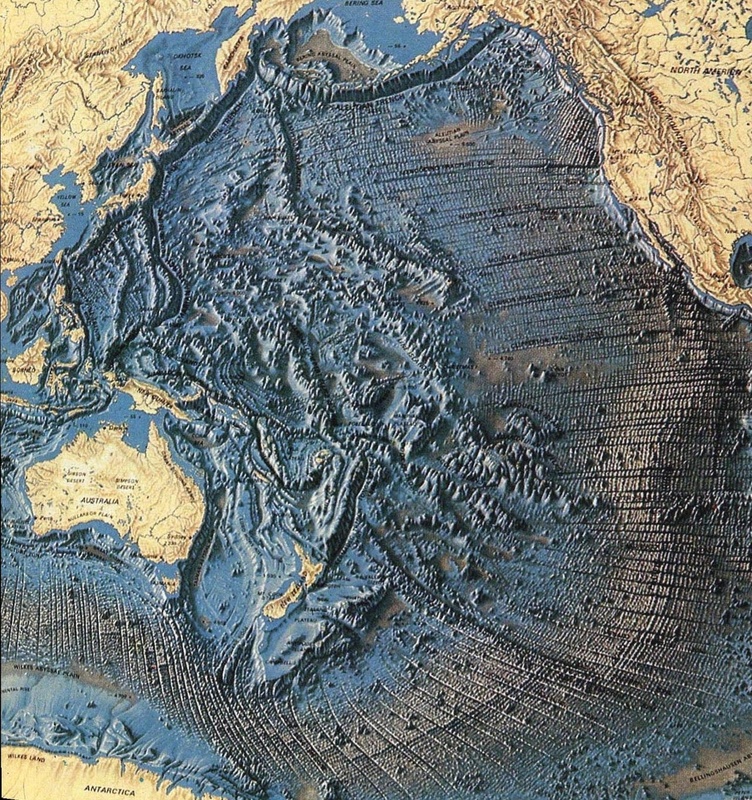 The ocean floors are not continuing to spread apart like the picture. The continents pulled apart, only one time and outwardly in all directions. The Earth Expanded. Try their experiment by getting a map. 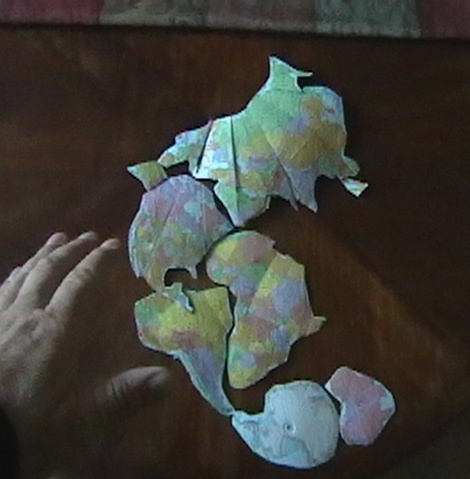 Then put it on your flat coffee table, use your hands to slide the pictures together and make Pangaea or Draw cartoon squished models of earth or Try my working model. If The Continental Drift Never Happened, Where Are They Getting The 100s of Millions Of Years From ? Is it because the theory of evolution is unseen in nature. They need time and missing links ? So How Did They Come Up With The Different Names And Periods ? Are You Being Misled On Purpose ? GO ON TO THE NEXT PAGE AND SEE MAN WALKED AND WAS WITH THE DINOSAURS. Wow. True. But, where did oceans come from? Hi David…thank you for visiting my site !!! The earth used to be smaller with a solid crust you could walk around. There were no high hills or mountains. There was lakes and seas on it were the crust was thin. The earth has a water table…a level that the water does not rise above. It collects in the earth. We also had a thicker atmophere when the earth was smaller. When the heat increased inside the earth, it created pressure by expanding some of the layers on the inside of it. Heat makes things expand. The pressure forced the water table higher and the heat rose into the atmosphere. The atmosphere then became thin and it started to rain. Before the earth expanded there was no rain. There were no oceans. When the land broke apart forming the continents, the magma from the inside the earth rose and filled the spaces in between. That formed the basalt/volcanic ocean floors. They are made up of different material then the clay crust/continents. Also they all were formed at the very same time. The rain coming down and the water that had risen on the smaller earth, filled in the oceans as the earth expanded. The rain coming down cooled of the magma and it solidified. Now we have oceans and they were only made about 4350 years ago. 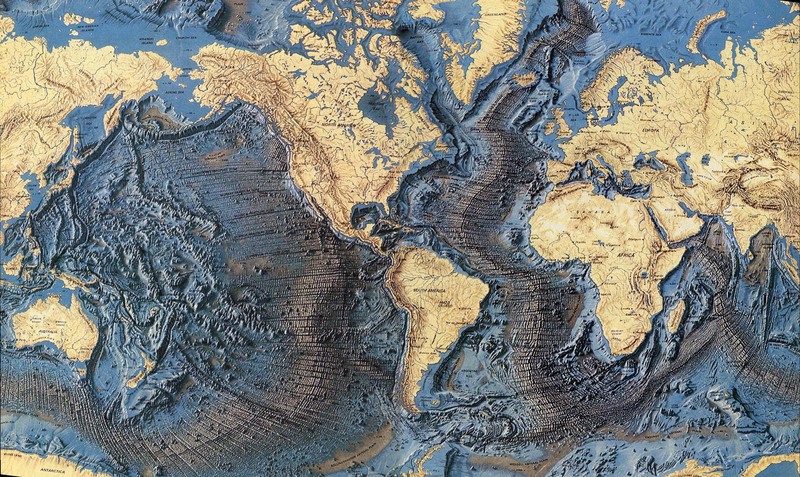 Science would like you to believe the continents float and slide around in the water and for billions of years. They say that is how oceans form and disappear. I wanted to share this intriguing response. I am learning a lot recently about geography.